Gouvy was a man from that much fought over frontier-land that is the Alsace-Lorraine. He pursued the symphony as a form with ornery doggedness. To be a composer of the symphony in France or Italy is to plough an eccentric furrow knowing that achievement will be against the tidal flow. Even so his symphonies gained some fame and performances in Paris. The influence of Beethoven can be heard but Gouvy is no Kiel or Spohr. His floreat came later and other tributaries run into the delta of his imagination. There is some Berlioz though the product is nowhere near as upstart or rebellious as the senior composer. There’s even a dash of Bizet. More often one can hear the fey lightness of Mendelssohn's faery music as in the third movement of the Third Symphony. This music also takes some of the ebullience of the Méhul symphonies; wonderful version of the Méhul on Nimbus by the Gulbenkian orchestra conducted by Swierczewski. The finale of Gouvy’s Third Symphony occupies a domain between Beethoven's Seventh and the finale of Mendelssohn Scottish; the latter quite strongly. There’s also a pleasingly yearning romantic second subject in the third movement. The bubbling power of the compact little Fifth Symphony - his last before an era of chamber music and oratorios - has a romping effervescence characteristic of Schubert's Ninth. 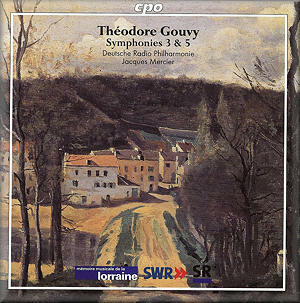 The work was premiered by the Gewandhaus orchestra who earlier had given German premieres of Gouvy's symphonies 2, 3 and 4. After a clod-hopping ländler style Minuetto there comes a Larghetto cantabile. And when it says cantabile it means cantabile - perhaps the influence of the recently flown grand era of bel canto. The finale is pointed and accented with great precision. There’s much use made of woodwind and string flurries differentiated with satisfying skill. Orchestra and conductor act as enthusiastic and thoughtful advocates. Sponsors the Théodore Gouvy Institute, Mémoire musical de la Lorraine and La Région Lorraine have every right to feel well pleased with the outcome and to support later volumes. Those with a taste for classical-romantic symphonies in an idiom pulled between Bizet, Beethoven and Mendelssohn need look no further.